Made for the Neo Game Jam. The theme is 'cosmos' and the optional theme 'peculiar loot' inspired the star absorbing mechanic. I didn't have a lot of time to work on this, but I've only done 1 game jam before this one, so I thought I might just make a small, simple game for this. 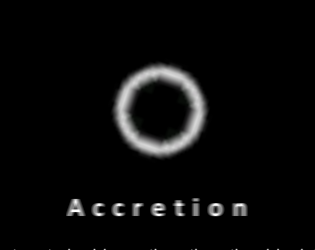 Accretion is a game where you play as a black hole, you must absorb the stars until you are big enough to absorb the other black hole chasing you.